David Straus, founder of Interaction Associates, defined a problem as “a situation someone wants to change.” I kept wondering why it was so hard to get my daughter to keep her room clean until I realized that, given Straus’ definition, only one of us has a problem. That is, only one of us wants the situation to change. Situation changing is at the heart of innovation. If innovation is what you get when you create something and put it to use, then the challenge of increasing innovation in our organizations becomes more than just a challenge of thinking up something new. Innovation also means getting someone to use what you create. It’s about turning interesting ideas into useful ideas. If you want someone to adopt an idea or use a new product, you’re essentially in the situation-changing business. So the challenge of increasing innovation in our organizations boils down to the challenge of creating situations people want to change. First an aspiring innovator should ask which someone would benefit from the innovation. In the teen daughter’s messy bedroom scenario, you’re much more likely to get me rather than my daughter to adopt an innovation. Think of the beneficiary that the innovation serves as the “target.” Next you need to figure out how to create a gap between the target’s current situation and a possible future situation in such a way that the target would be motivated to adopt an innovation that closes the gap. Think of the gap between what a target has and what a target could have as the “tension.” Organizational innovation depends on choosing the right target and clearly defining a compelling tension. There are three ways to think about resolving tension for a given target: (1) problem-solving, (2) problem-finding, and (3) problem creation. Let’s consider some examples and see how each approach to tension resolution might result in an innovation. In problem solving, the target is aware of a dissatisfying situation and is open to an innovation that resolves it. 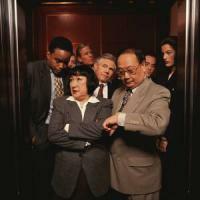 Consider the classic problem of waiting for a slow elevator in a high-rise office building or hotel. The target, in this case, are people waiting for the elevator to arrive. The tension is created by the experience of wanting to reach a destination in less time; it’s a situation someone wants to change. An innovation that resolves the tension might involve an engineering innovation that increases elevator speed or reduces wait-time. Problem finding is a term used in the creativity and innovation literature to draw a distinction between a “discovered problem” and a “presented problem.” Staying with the target—the people waiting for the elevator to arrive—it’s possible that other formulations of the problem may be discovered; that other tensions exist. Elevator companies responding to complaints from their earliest customers about long wait times and slow speeds began to install mirrors inside the elevators and in the lobbies near the buttons used to call the elevators. Instead of solving a slow-elevator problem, they starting solving the bored-elevator rider problem. The tension to be resolved by an innovation shifted from an inability to quickly reach a destination to a frustrating awareness of how much time is passing without anything interesting or productive to do. In 1970, Edward de Bono coined the phrase “lateral thinking” to describe the kind of thought process that introduces interesting solutions often by changing how one conceptualizes the problem. Once in awhile, ideas occur to us unprompted by the need to change a situation. George de Mestral, a Swiss engineer, returned home from a hunting trip with his dog and became interested in the properties of the burrs stuck to the dog’s fur and to his jacket. In time, his attempts to mimic the powerful grip of the burs became Velcro brand hook and loop fasteners. To commercialize the invention, Mestral’s challenge was to find a target and define a tension that Velcro would resolve. You might be surprised to learn that it took years before Velcro became the ubiquitous fastener we depend on today. It’s not the brilliance of the idea that turns a creative outcome into a productive success; it’s finding the right individual or group and then creating enough of a tension that people would be willing to change their situation. Not until NASA elected to use Metral’s invention to redesign the closures on spacesuits did Velcro start to become a commercial success. What the three approaches to innovation have in common are a target and a tension. If you want to get innovation going in an organizational setting, you need to choose a target the organization cares about and you need to define a situation that the target wants or will want to change. The methodology outlined here describes a systematic way to get the seeds of innovation that are buried in our organizations planted, watered, and nurtured so that they grow into something that sees the light of day. There are well-researched and very effective innovation methodologies that start with a focus on the end-user and his or her unmet needs. What both methodologies have in common is a focus on who will benefit from the innovation and what’s compelling about the change that the innovation will deliver. The big difference between the methodologies is that one starts with your organization’s untapped innovation; the other requires an investment in some fairly sophisticated research. Organizational ideas compete in a marketplace for executive attention and resources. Whether an innovation results in a structural change, a process change, or a new product, whether the target is a paying customer or a colleague in another department, new ideas need some form of sponsorship before they’re piloted. Leaders can help their teams break through the barrage of issues and requests distracting potential sponsors by helping potential innovators think in terms of target and tension.